These Baked Fruity Pebble Donuts feature a fluffy vanilla batter, packed with sweet Fruity Pebbles. The donuts are baked and then topped with a rich, vanilla glaze. Healthier than the fried kind and so delicious, these treats will bring out the kid inside of you! Today, I’m breaking out the kid inside of me. And it’s all about Fruity Pebbles…my favorite cereal! Yes, I am a grown adult who still loves to indulge in a sugary-filled breakfast every now and then. I will admit it. No shame here. Truth be told, I love cereal, but I don’t eat it all that often. The hubster eats cheerios for breakfast several times a week, and when I do slurp down a bowl, it’s usually a few times a month. Which means that it’s totally acceptable for me to indulge in this sweet-tasting, calorie-loaded cereal. Right? Sometimes, I’m more of an adult and will buy healthier cereals. But every now and then, a box of Fruity Pebbles (or Froot Loops and Trix) makes it way into my kitchen. 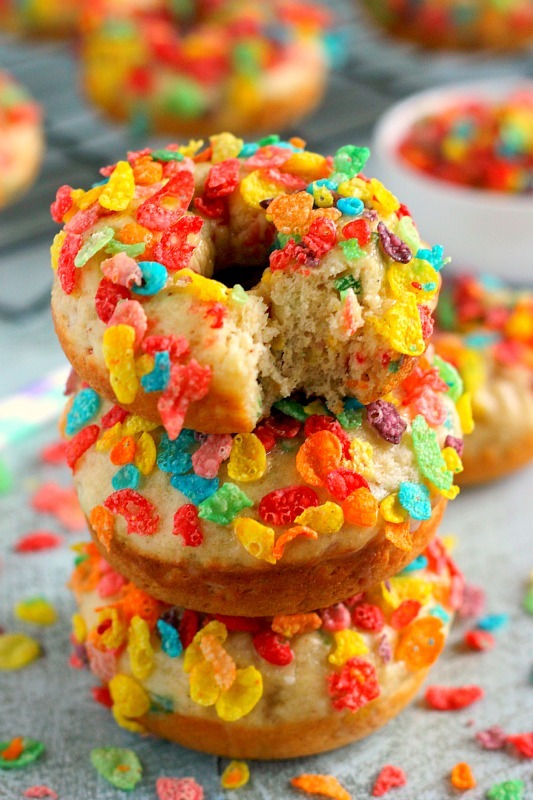 And that’s why I’m so excited to share these Baked Fruity Pebble Donuts with you! Now, I know these donuts aren’t new. You’ve probably seen a version or two floating around Pinterest world. But for me, these are my first time baking (and eating) them. And since I love sharing my favorite recipes, I thought these would be a perfect treat. 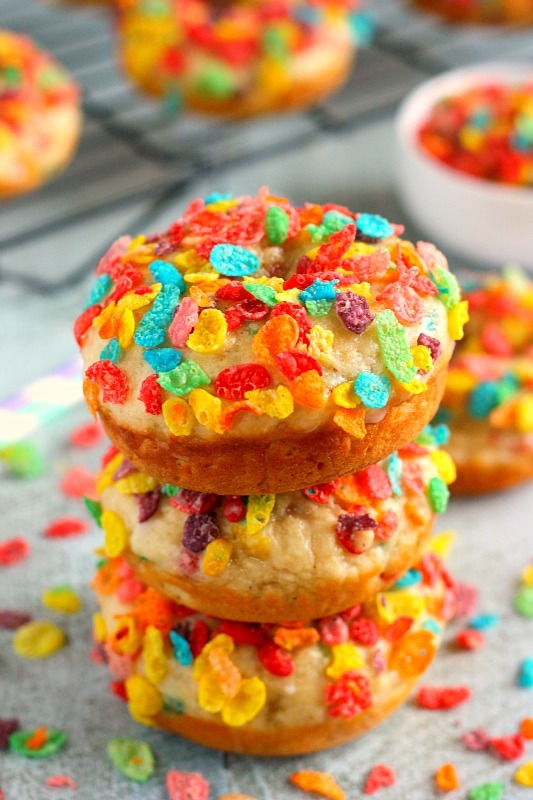 If you love Fruity Pebbles like I do, then these baked donuts were made for you. The cereal is baked right into the batter and then sprinkled on top. It’s sweet, delicious, and contains a satisfying crunch. 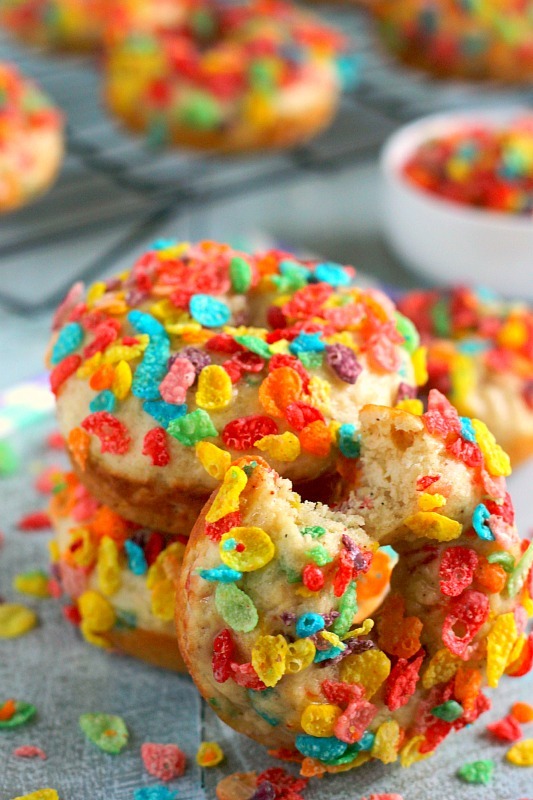 And like most of my recipes, these Baked Fruity Pebble Donuts take just minutes to whip up. From start to finish, you can have these cuties ready to be devoured in less than a half hour. Sounds pretty good, right? The best part (besides eating these) is frosting the donuts. The glaze consists of powdered sugar, milk, and vanilla extract. Once the donuts are dipped into the glaze, it’s time to get crazy with the Fruity Pebble topping. The cereal makes these donuts eye-appealing because of the bright colors. Almost too pretty to eat…almost! So the next time you’re in the mood for a fun and delicious treat, whip up a batch of these Baked Fruity Pebble Donuts! 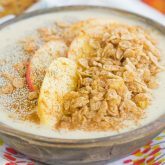 It will bring out the kid inside of you and become a new breakfast or dessert favorite. 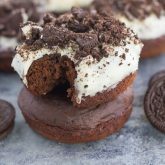 Looking for more donut recipes? I’ve got you covered! Preheat oven to 375F. Lightly spray two 6-count donut pans with cooking spray. Set aside. In a large bowl, combine the flour, baking powder, baking soda, nutmeg, salt, white sugar, and brown sugar. Set aside. In a medium bowl, whisk together the milk, yogurt, eggs. Whisk until smooth. Add the butter, oil, and vanilla extract to egg mixture. Whisk until smooth. Slowly pour the wet ingredients into the flour mixture, stirring until just combined. Batter will be very thick. Gently fold in the Fruity Pebbles. Spoon mixture into a large ziplock bag and cut tip of bottom corner. Pipe mixture into prepared donut pans. Bake for 8-10 minutes, or until donuts are slightly firm. Remove from oven and cool completely before adding glaze. To prepare the glaze, whisk the powdered sugar, milk, and vanilla in a medium bowl. Spread Fruity Pebbles onto a paper plate or a bowl. Take each donut and dunk halfway into glaze, then dip into Fruity Pebbles. Repeat with rest of donuts. You're getting wild and crazy on a Friday, Gayle. I like it! I mean, who could resist this amazing dose of sugary goodness for breakfast? The're fabulous! These donuts are TOTAL Friday food and I completely approve! ;) And since they're baked, that means ZERO guilt on my part if I end up eating like 20 right?? They just look that amazing! Oh my gosh, this is the definition of "kid friendly!" 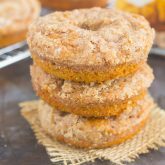 My donut-obsessed boys would go crazy for this breakfast! So fun! Oh my gosh, how I wish I still had a house full of kids - although I think the grown-up kids will ADORE these when they come home to visit! Yes! My husband and I devoured these in no time! Oh my goodness! I'm feeling so nostalgic. Fruity Pebbles, Cocoa pebbles, and peanut butter Cap'n Crunch have always been my favorite cereals. Having one in a donut makes me so happy. How fun are these?!! ???? Thanks for the donut love, Amanda! I just couldn't resist making these! THese just scream fun, don't they! Love all the colors! Oh girl! These are SO bright and fun! Perf for the weekend!! Happy Friday!! xoxo Cailee!! Thank you, Cailee! Happy Friday to you, too! How fun are these??!!! 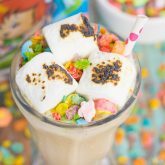 I haven't had Fruity Pebbles in the longest time - that's about to change! Sugary cereal is one of my secret guilty pleasures - shhhh :D I love how fun those donuts look - perfect for a special morning treat! So glad I'm not the only one! :) Thanks, Nora! Gayle I love fruity pebbles just second to lucky charms!! Love this version where I get to eat cereal & doughnuts!! Yumm, I can so go for one right now with my coffee!! I used to love fruity pebbles, and these are SO fun! I love all the colors and those fluffy vanilla donuts. If this isn't a fun breakfast to wake up to, I don't know what is! Gayle, I love these donuts!!!! brilliant!!!!! These are so cool Gayle! Love the colors! I'm sure every kid is gonna love them! Yes please give me all of these! I am addicted to Fruity Pebbles. The kid in me is screaming for some right now. Thanks for the donut love, Dorothy!